We grew this just for fun last year and not only was it one of our most talked about plants it became one of our favorites as well. Each yellow/gold/burnt umber flower is intricately and completely marked in black lines. On very close inspection they almost look like a drawing of flowers. And its the most FRAGRANT viola we’ve ever smelled with a sweet perfume that carries quite a distance. Compact hardy annual to 6″ x 6″ for full sun to light shade. Excellent tolerance of cold (down to zone 7) as well as heat. All around its a winner of a viola, for containers, borders etc. Blooms non-stop, removing spent flowers does encourage more. 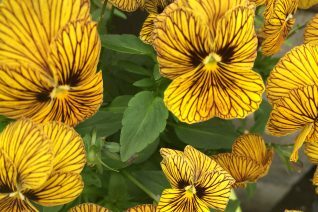 Stop and smell the Violas and then stare at the patterns. Its a trip man. This cool cultivar of Parma violet can be difficult to stumble upon. 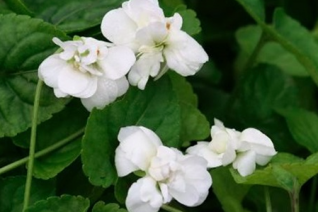 We love the plush double white flowers that sends its sweet perfume on the breeze in late winter to mid-spring. 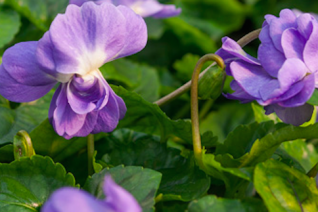 Parma violets are basically the Sicilian version of the common sweet violet (Viola odorata). They are not nearly as cold hardy or pernicious as the species and they tend to have much larger more opulent and fragrant flowers. Also, their leaves are distinctively glossy as opposed to matte. This little sweetie forms spreading patches and the long stems are a bit weak for the large double white flowers- they tend to bend. Excellent for small bouquets that you can sniff and sniff. In the garden they need a sheltered position away from the freeze and thaw and harsh conditions in the open. Instead coset them under large shrubs and among ephemeral early perennials such as Anemones, and small bulbs like species Crocus. Part shade- they bloom best with a bit of sun. Regular summer water encourages them to spread. This form seldom sets seed- I don’t think I’ve ever seen seed in fact. Pity. Rare plant. 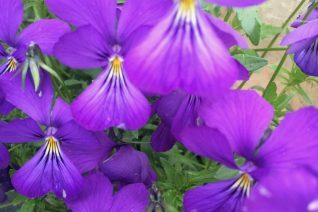 One of the parents of modern violas this perennial is short lived but while its around its never out of bloom- year round. Slender indigo blue flowers are small but profuse on a compact plant to just 6″ tall and barely wider than that. Seeds itself around prolifically…how the seeds find their way so far from the parent plant is natures mystery. It will germinate anywhere – cracks, beneath rocks. Sun, Shade. Very hardy to way, way below 0ºF. Light summer water during the hottest weather. Part shade in nearly any texture soil. Mediterranean wild flower.